Cooldine proved a cut above the opposition when recording a 16-length success in the Grade One RSA Chase to give trainer Willie Mullins and jockey Ruby Walsh a quickfire 10.4/1 double following the success of Mikael d’Haguenet in the preceding Ballymore Novices’ Hurdle. Carruthers did all the donkey work out in front but it was clear at the top of the hill that there was nothing travelling better than the 9/4 favourite who powered right away in the colours of Archie and Violet O’Leary, who previously won this race with Florida Pearl in 1998. Trainer Willie Mullins said: “He jumped from fence to fence today. He made a mistake in his schooling session at Leopardstown, but Ruby blamed himself for that. “There is no room for mistakes if you want to win the RSA Chase and this horse always has the ability to find a fifth leg. “I thought if he jumped today, there would be very few horses that would outstay him. He has out and out stamina. I thought he was my best chance of success today and I could believe how easily Mikael d’Haguenet won earlier today. However, Cooldine almost didn’t make the line up today as Mullins explained: “About an hour and a half before the race my head girl Ali called me to say the horse was lame and only standing on three legs. “I had the farrier Richard have a look at him and it transpired that one shoe was too tight and a nail was pressing on him. Richard managed to glue a new shoe on him and added some pollyfiller. We then put some ice on him for about an hour. Richard did a fantastic job - I owe him a drink tonight! 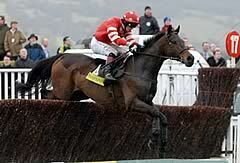 Ruby Walsh added: “I love this horse, I have always loved this horse. “He has the heart of a lion and jumped like a stag. Cooldine became Europe’s leading novice chaser when winning the RSA Chase, but there was a surprisingly good run by second-placed Horner Woods, who started at 66-1. The Jessica Harrington-trained seven-year-old won a beginners’ event at Limerick last month over two miles and one furlong, a very distant cry from the demands of today’s event. Yet he belied his odds under jockey Robbie Power, and although 16 lengths behind the winner was nine lengths clear of the third. Ironically he had been due to run in tomorrow’s Jewson Novices’ Chase with a featherweight, but was balloted out. A surprised Harrington said: “Everything has gone wrong for him this season. First time out he was all wrong, then he fell, then he ran at Christmas and nothing went right in the race - Robert couldn’t ride him because he got hurt - and despite that he was only just beaten. “Then we had snow and heavy ground and I couldn’t find an opportunity for him, so I was forced to go to Limerick on ground that was too deep for him and a race over two miles and a furlong. He only just got home, but I knew he needed three miles and good ground. “He’s a brilliant jumper, and since I put a new bridle on him with a Swedish snaffle that acts like a gag he’s been much improved. He was exploding over fences and not listening. Philip Hobbs, trainer of third-placed Massini’s Maguire, said: “Now we know he stays this trip it’s a big plus, because it was a doubt. It’s disappointing to be beaten so far, but he’s finished ahead of Carruthers and What A Friend. Carruthers, with Mattie Bachelor on board, made the pace until three out, when a mistake cost him dear. "He just made a horlicks of it which didn’t help him, but I’m really chuffed with that. He’s just a big baby. Now he’s finished for the season, we’ll put him out in a field," said trainer Mark Bradstock. 1. The RSA Chase is run with its current title for the first time this year although is backed by one of Cheltenham’s longest-running sponsors. It was run as the Royal & SunAlliance Chase up to 2008 and as the Royal SunAlliance Chase in 1997. Sun Alliance, which merged with Royal Insurance in 1996, previously backed the Sun Alliance Chase for 23 years and sponsored at Cheltenham for 26 years altogether. From 1971-73, the Foxhunter Chase was titled the Sun Alliance & London Foxhunters. 5. Fred Winter had the best record in the contest, having landed three victories with Killiney (1973), Pengrail (1975) and Brown Chamberlin (1982). Among current trainers Willie Mullins and Paul Nicholls have both landed the race twice, Mullins having sent out Rule Supreme (2004) and Florida Pearl (1998) while Nicholls has trained the past two of the past three winners – Star De Mohaison (2006) and Denman (2007). 7. The most successful jockey in the RSA Chase has been Peter Scudamore, who notched up a hat-trick from 1991 to 1993 with Rolling Ball, Miinnehoma and Young Hustler. The latter went on to further big-race success while Miinnehoma won the 1994 Grand National. 10. The West Awake is the only horse to have won both the Ballymore Properties Novices’ Hurdle (previously the RSA Novices’ Hurdle) and the RSA Chase. He won the Hurdle in 1987 and the Chase in 1988.